obj = unscentedKalmanFilter(StateTransitionFcn,MeasurementFcn,InitialState) creates an unscented Kalman filter object for online state estimation of a discrete-time nonlinear system. StateTransitionFcn is a function that calculates the state of the system at time k, given the state vector at time k-1. MeasurementFcn is a function that calculates the output measurement of the system at time k, given the state at time k. InitialState specifies the initial value of the state estimates. After creating the object, use the correct and predict commands to update state estimates and state estimation error covariance values using a discrete-time unscented Kalman filter algorithm and real-time data. obj = unscentedKalmanFilter(StateTransitionFcn,MeasurementFcn,InitialState,Name,Value) specifies additional attributes of the unscented Kalman filter object using one or more Name,Value pair arguments. obj = unscentedKalmanFilter(StateTransitionFcn,MeasurementFcn) creates an unscented Kalman filter object using the specified state transition and measurement functions. Before using the predict and correct commands, specify the initial state values using dot notation. For example, for a two-state system with initial state values [1;0], specify obj.State = [1;0]. obj = unscentedKalmanFilter(StateTransitionFcn,MeasurementFcn,Name,Value) specifies additional attributes of the unscented Kalman filter object using one or more Name,Value pair arguments. Before using the predict and correct commands, specify the initial state values using Name,Value pair arguments or dot notation. obj = unscentedKalmanFilter(Name,Value) creates an unscented Kalman filter object with properties specified using one or more Name,Value pair arguments. Before using the predict and correct commands, specify the state transition function, measurement function, and initial state values using Name,Value pair arguments or dot notation. unscentedKalmanFilter creates an object for online state estimation of a discrete-time nonlinear system using the discrete-time unscented Kalman filter algorithm. Consider a plant with states x, input u, output y, process noise w, and measurement noise v. Assume that you can represent the plant as a nonlinear system. Here f is a nonlinear state transition function that describes the evolution of states x from one time step to the next. The nonlinear measurement function h relates x to the measurements y at time step k. w and v are the zero-mean, uncorrelated process and measurement noises, respectively. These functions can also have additional input arguments that are denoted by us and um in the equations. For example, the additional arguments could be time step k or the inputs u to the nonlinear system. There can be multiple such arguments. Note that the noise terms in both equations are additive. That is, x(k) is linearly related to the process noise w(k-1), and y(k) is linearly related to the measurement noise v(k). When you perform online state estimation, you first create the nonlinear state transition function f and measurement function h. You then construct the unscentedKalmanFilter object using these nonlinear functions, and specify whether the noise terms are additive or nonadditive. 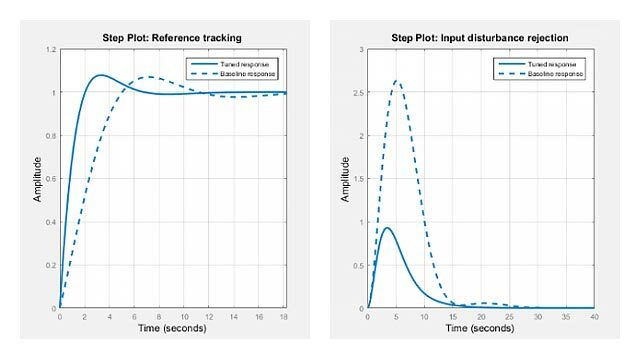 After you create the object, you use the predict command to predict state estimates at the next time step, and correct to correct state estimates using the unscented Kalman filter algorithm and real-time data. For information about the algorithm, see Extended and Unscented Kalman Filter Algorithms for Online State Estimation. Correct the state and state estimation error covariance at time step k using measured data at time step k.
Predict the state and state estimation error covariance at time the next time step. Create another object with the same object property values. Do not create additional objects using syntax obj2 = obj. Any changes made to the properties of the new object created in this way (obj2) also change the properties of the original object (obj). For unscentedKalmanFilter object properties, see Properties. To define an unscented Kalman filter object for estimating the states of your system, you write and save the state transition function and measurement function for the system. In this example, use the previously written and saved state transition and measurement functions, vdpStateFcn.m and vdpMeasurementFcn.m. These functions describe a discrete-approximation to van der Pol oscillator with nonlinearity parameter, mu, equal to 1. The oscillator has two states. Specify an initial guess for the two states. You specify the initial state guess as an M-element row or column vector, where M is the number of states. Create the unscented Kalman filter object. Use function handles to provide the state transition and measurement functions to the object. The object has a default structure where the process and measurement noise are additive. To estimate the states and state estimation error covariance from the constructed object, use the correct and predict commands and real-time data. Create an unscented Kalman filter object for a van der Pol oscillator with two states and one output. Use the previously written and saved state transition and measurement functions, vdpStateFcn.m and vdpMeasurementFcn.m. These functions are written for additive process and measurement noise terms. Specify the initial state values for the two states as [2;0]. Since the system has two states and the process noise is additive, the process noise is a 2-element vector and the process noise covariance is a 2-by-2 matrix. Assume there is no cross-correlation between process noise terms, and both the terms have the same variance 0.01. You can specify the process noise covariance as a scalar. The software uses the scalar value to create a 2-by-2 diagonal matrix with 0.01 on the diagonals. Specify the process noise covariance during object construction. Alternatively, you can specify noise covariances after object construction using dot notation. For example, specify the measurement noise covariance as 0.2. Since the system has only one output, the measurement noise is a 1-element vector and the MeasurementNoise property denotes the variance of the measurement noise. Create an unscented Kalman filter object for a van der Pol oscillator with two states and one output. Assume that the process noise terms in the state transition function are additive. That is, there is a linear relation between the state and process noise. Also assume that the measurement noise terms are nonadditive. That is, there is a nonlinear relation between the measurement and measurement noise. Specify the state transition function and measurement functions. Use the previously written and saved functions, vdpStateFcn.m and vdpMeasurementNonAdditiveNoiseFcn.m. The state transition function is written assuming the process noise is additive. The measurement function is written assuming the measurement noise is nonadditive. Specify the initial state values for the two states as [2;0]. You can now use the correct and predict commands to estimate the state and state estimation error covariance values from the constructed object. The process noise w of the system is additive while the measurement noise v is nonadditive. Create the state transition function and measurement function for the system. Specify the functions with an additional input u.
f and h are function handles to the anonymous functions that store the state transition and measurement functions, respectively. In the measurement function, because the measurement noise is nonadditive, v is also specified as an input. Note that v is specified as an input before the additional input u. Create an unscented Kalman filter object for estimating the state of the nonlinear system using the specified functions. Specify the initial value of the state as 1, and the measurement noise as nonadditive. Specify the measurement noise covariance. You can now estimate the state of the system using the predict and correct commands. You pass the values of u to predict and correct, which in turn pass them to the state transition and measurement functions, respectively. Correct the state estimate with measurement y[k]=0.8 and input u[k]=0.2 at time step k.
Predict the state at next time step, given u[k]=0.2. State transition function f, specified as a function handle. The function calculates the Ns-element state vector of the system at time step k, given the state vector at time step k-1. Ns is the number of states of the nonlinear system. You write and save the state transition function for your nonlinear system, and use it to construct the object. For example, if vdpStateFcn.m is the state transition function, specify StateTransitionFcn as @vdpStateFcn. You can also specify StateTransitionFcn as a function handle to an anonymous function. Where x(k) is the estimated state at time k, and Us1,...,Usn are any additional input arguments required by your state transition function, such as system inputs or the sample time. During estimation, you pass these additional arguments to the predict command, which in turn passes them to the state transition function. To see an example of a state transition function with additive process noise, type edit vdpStateFcn at the command line. Measurement function h, specified as a function handle. The function calculates the N-element output measurement vector of the nonlinear system at time step k, given the state vector at time step k. N is the number of measurements of the system. You write and save the measurement function, and use it to construct the object. For example, if vdpMeasurementFcn.m is the measurement function, specify MeasurementFcn as @vdpMeasurementFcn. You can also specify MeasurementFcn as a function handle to an anonymous function. Where y(k) and x(k) are the estimated output and estimated state at time k, and Um1,...,Umn are any optional input arguments required by your measurement function. For example, if you are using multiple sensors for tracking an object, an additional input could be the sensor position. During estimation, you pass these additional arguments to the correct command, which in turn passes them to the measurement function. To see an example of a measurement function with additive process noise, type edit vdpMeasurementFcn at the command line. To see an example of a measurement function with nonadditive process noise, type edit vdpMeasurementNonAdditiveNoiseFcn. Initial state estimates, specified as an Ns-element vector, where Ns is the number of states in the system. Specify the initial state values based on your knowledge of the system. The specified value is stored in the State property of the object. If you specify InitialState as a column vector then State is also a column vector, and predict and correct commands return state estimates as a column vector. Otherwise, a row vector is returned. Tunable properties that you can specify multiple times, either during object construction using Name,Value arguments, or any time afterwards during state estimation. After object creation, use dot notation to modify the tunable properties. The tunable properties are State, StateCovariance, ProcessNoise, MeasurementNoise, Alpha, Beta, and Kappa. Nontunable properties that you can specify once, either during object construction or afterward using dot notion. Specify these properties before state estimation using correct and predict. The StateTransitionFcn and MeasurementFcn properties belong to this category. Nontunable properties that you must specify during object construction. The HasAdditiveProcessNoise and HasAdditiveMeasurementNoise properties belong to this category. Spread of sigma points around mean state value, specified as a scalar value between 0 and 1 ( 0 < Alpha <= 1). The unscented Kalman filter algorithm treats the state of the system as a random variable with mean value State and variance StateCovariance. To compute the state and its statistical properties at the next time step, the algorithm first generates a set of state values distributed around the mean State value by using the unscented transformation. These generated state values are called sigma points. The algorithm uses each of the sigma points as an input to the state transition and measurement functions to get a new set of transformed state points and measurements. The transformed points are used to compute the state and state estimation error covariance value at the next time step. Alpha — Determines the spread of the sigma points around the mean state value. It is usually a small positive value. The spread of sigma points is proportional to Alpha. Smaller values correspond to sigma points closer to the mean state. Kappa — A second scaling parameter that is usually set to 0. Smaller values correspond to sigma points closer to the mean state. The spread is proportional to the square-root of Kappa. Beta — Incorporates prior knowledge of the distribution of the state. For Gaussian distributions, Beta = 2 is optimal. If you know the distribution of state and state covariance, you can adjust these parameters to capture the transformation of higher-order moments of the distribution. The algorithm can track only a single peak in the probability distribution of the state. If there are multiple peaks in the state distribution of your system, you can adjust these parameters so that the sigma points stay around a single peak. For example, choose a small Alpha to generate sigma points close to the mean state value. For more information, see Unscented Kalman Filter Algorithm. Alpha is a tunable property. You can change it using dot notation. Characterization of the state distribution that is used to adjust weights of transformed sigma points, specified as a scalar value greater than or equal to 0. For Gaussian distributions, Beta = 2 is an optimal choice. For more information, see the Alpha property description. Beta is a tunable property. You can change it using dot notation. Where y(k) and x(k) are the estimated output and estimated state at time k, and Um1,...,Umn are any optional input arguments required by your measurement function. HasAdditiveMeasurementNoise is a nontunable property, and you can specify it only during object construction. You cannot change it using dot notation. Where x(k) is the estimated state at time k, and Us1,...,Usn are any additional input arguments required by your state transition function. HasAdditiveProcessNoise is a nontunable property, and you can specify it only during object construction. You cannot change it using dot notation. Spread of sigma points around mean state value, specified as a scalar value between 0 and 3 ( 0 <= Kappa <= 3). Kappa is typically specified as 0. Smaller values correspond to sigma points closer to the mean state. The spread is proportional to the square-root of Kappa. For more information, see the Alpha property description. Kappa is a tunable property. You can change it using dot notation. Measurement function h, specified as a function handle. The function calculates the N-element output measurement vector of the nonlinear system at time step k, given the state vector at time step k. N is the number of measurements of the system. You write and save the measurement function and use it to construct the object. For example, if vdpMeasurementFcn.m is the measurement function, specify MeasurementFcn as @vdpMeasurementFcn. You can also specify MeasurementFcn as a function handle to an anonymous function. Where y(k) and x(k) are the estimated output and estimated state at time k, and Um1,...,Umn are any optional input arguments required by your measurement function. For example, if you are using multiple sensors for tracking an object, an additional input could be the sensor position. During estimation, you pass these additional arguments to the correct command which in turn passes them to the measurement function. MeasurementFcn is a nontunable property. You can specify it once before using the correct command either during object construction or using dot notation after object construction. You cannot change it after using the correct command. HasAdditiveMeasurementNoise is true — Specify the covariance as a scalar or an N-by-N matrix, where N is the number of measurements of the system. Specify a scalar if there is no cross-correlation between measurement noise terms and all the terms have the same variance. The software uses the scalar value to create an N-by-N diagonal matrix. HasAdditiveMeasurementNoise is false — Specify the covariance as a V-by-V matrix, where V is the number of measurement noise terms. MeasurementNoise must be specified before using correct. After you specify MeasurementNoise as a matrix for the first time, to then change MeasurementNoise you can also specify it as a scalar. Specify as a scalar if there is no cross-correlation between the measurement noise terms and all the terms have the same variance. The software extends the scalar to a V-by-V diagonal matrix with the scalar on the diagonals. MeasurementNoise is a tunable property. You can change it using dot notation. HasAdditiveProcessNoise is true — Specify the covariance as a scalar or an Ns-by-Ns matrix, where Ns is the number of states of the system. Specify a scalar if there is no cross-correlation between process noise terms, and all the terms have the same variance. The software uses the scalar value to create an Ns-by-Ns diagonal matrix. HasAdditiveProcessNoise is false — Specify the covariance as a W-by-W matrix, where W is the number of process noise terms. ProcessNoise must be specified before using predict. After you specify ProcessNoise as a matrix for the first time, to then change ProcessNoise you can also specify it as a scalar. Specify as a scalar if there is no cross-correlation between the process noise terms and all the terms have the same variance. The software extends the scalar to a W-by-W diagonal matrix. ProcessNoise is a tunable property. You can change it using dot notation. State of the nonlinear system, specified as a vector of size Ns, where Ns is the number of states of the system. When you use the predict command, State is updated with the predicted value at time step k using the state value at time step k–1. When you use the correct command, State is updated with the estimated value at time step k using measured data at time step k.
The initial value of State is the value you specify in the InitialState input argument during object creation. If you specify InitialState as a column vector, then State is also a column vector, and the predict and correct commands return state estimates as a column vector. Otherwise, a row vector is returned. If you want a filter with single-precision floating-point variables, you must specify State as a single-precision variable during object construction using the InitialState input argument. State is a tunable property. You can change it using dot notation. State estimation error covariance, specified as a scalar or an Ns-by-Ns matrix, where Ns is the number of states of the system. If you specify a scalar, the software uses the scalar value to create an Ns-by-Ns diagonal matrix. Specify a high value for the covariance when you do not have confidence in the initial state values that you specify in the InitialState input argument. When you use the predict command, StateCovariance is updated with the predicted value at time step k using the state value at time step k–1. When you use the correct command, StateCovariance is updated with the estimated value at time step k using measured data at time step k.
StateCovariance is a tunable property. You can change it using dot notation after using the correct or predict commands. You write and save the state transition function for your nonlinear system and use it to construct the object. For example, if vdpStateFcn.m is the state transition function, specify StateTransitionFcn as @vdpStateFcn. You can also specify StateTransitionFcn as a function handle to an anonymous function. StateTransitionFcn is a nontunable property. You can specify it once before using the predict command either during object construction or using dot notation after object construction. You cannot change it after using the predict command. Unscented Kalman filter object for online state estimation, returned as an unscentedKalmanFilter object. This object is created using the specified properties. Use the correct and predict commands to estimate the state and state estimation error covariance using the unscented Kalman filter algorithm. When you use predict, obj.State and obj.StateCovariance are updated with the predicted value at time step k using the state value at time step k–1. When you use correct, obj.State and obj.StateCovariance are updated with the estimated values at time step k using measured data at time step k.
For more information, see Generate Code for Online State Estimation in MATLAB.